Exactly one year ago, we arrived in Portugal! And the day of arriving, I could feel that this was the right place for us: the horses where immediately comfortable and at ease, and everything was beautiful and sunny! Even my 24 yo Maestro enjoys his life here very much: he’s full of energy and neighs every morning from the full chest when the day begins (I’ll make a video of that soon). 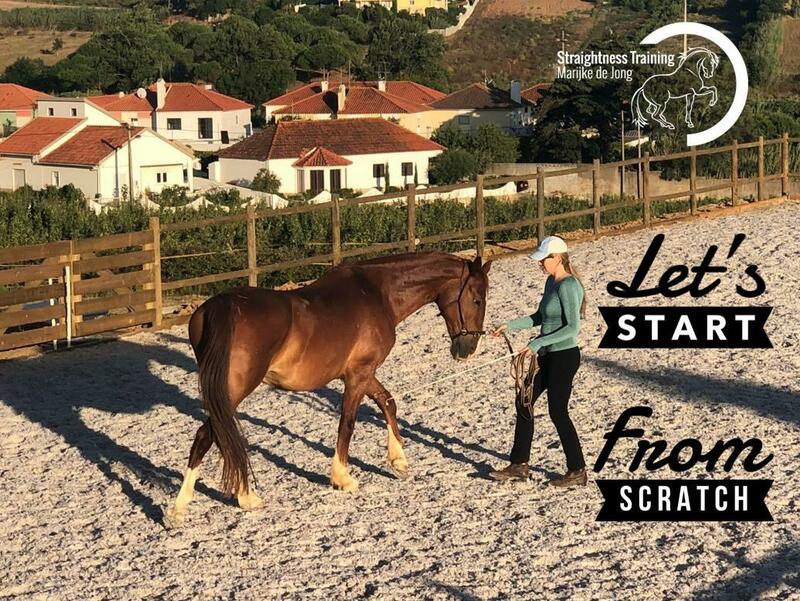 Now moving to Portugal is the best decision we’ve made in 2017, and we’re very lucky to be able to live here and to share our horse training experiences with you from the newly built arena. And it’s really fascinating to start from scratch after 10 months of holiday for the horses and to get back on track. It’s such a pleasure and privilege to work with them because they are very motivated, giving their all, so it’s really fun to shoot new videos. Therefore, for the future, we have many plans to create even more value and educational videos, so we can help, inspire and serve riders from all over the world even better! And I cannot wait to meet the new group of Mastery Students in the Mastery 2018 Class that we’re about to start in our ST Academy in September 2018! The ST Academy is a great place to learn Straightness Training (ST) online and remotely! The internet and widespread use of the computer allows you to distantly receive education and study, to engage with learning materials at home, and to practice in your own riding arena at your own pace. Tutorial support is provided via our virtual learning environment, online video lesson system, email, and other electronic means. Now in the near future, things are about to change a bit in the ST Academy. Therefore, we will be making a very special and last-time offer for the ST enthusiasts who jump on board of the Mastery 2018 Class in September 2018. When Maestro came into my life, I struggled a lot, since he was so complicated. And the solution – which made things like carrying a rider a 100 times easier for him – was Straightness Training. Since then, I found out that many more horses suffered from their natural asymmetry and the imbalance that it created in their bodies and movements. So from that moment on, I decided to dedicate my life to Straightness Training and to spread the knowledge worldwide to end unnecessary suffering. And it gives me a lot of fulfillment and joy that so many riders, on all continents, are making such positive changes for their horses. And with ST they are not only able to turn things around for their horse but also in other relationships and aspects of their lives. That’s the reason why I keep improving my educational materials and why we’re going to work intensively in 2019 to optimize the ST Academy for all our two and four-legged students. Because it’s really amazing to see that distant learning works! Of course, nothing beats hands-on teaching, but if you live in Indonesia, or South Africa, or the Faroe Islands, or Tasmania, it’s not always easy to find good hands-on teaching. Then online education is the solution! It really works, and it’s great to see some of our pioneer students entering the higher levels in our programs! I am very proud of them! Now in the last 4 years, we have invested a lot in professionalizing and optimizing the educational programs in the ST Academy, and especially in our online video feedback system, the ST Evaluation Program. A select group of our ST Instructors joined our special and in-depth schooling to become an official ST Evaluator, and they are now able to evaluate videos from Mastery students in tune with and tailored to the knowledge and skill as recorded in the Mastery Program and the Evaluation Guidelines that I have developed. And the ST Evaluation Program is really great! It truly helps people to compare their work to a standard, to school their eye, and to improve their skills so that they can become a better version of themselves. Also, it’s really special to see so many students ‘graduating’ for their touchstones but also in all training pillars – groundwork, longeing, work in hand riding, and liberty – in Grade 1, Grade 2, Grade 3, and this year most likely also in Grade 4! Super cool! So far, new Mastery Students could join the ST Evaluation Program for free, and they also received 5 free Touchstones (video reviews) at the start of their Mastery journey. However, many hours of workforce have been devoted to designing the Evaluation Program, building the online system, training the ST Instructors, and hiring ST Evaluators to evaluate the over 2500 Touchstones. Therefore, when we start the new Mastery 2018 Class, we intend to integrate the costs of evaluating in the Class tuition and to increase the prices for evaluating, because we expect huge growth in online video lessons and the associated investments. They STILL get 5 video evaluations for free. It means the new (higher) Class tuition will not apply to them! So If you’re thinking about joining our online ST Academy, get on the waitlist for the Mastery 2019 Class to get notified when registration is open. And I’m looking forward to start working together with the new students in the Mastery 2019 Class at the end of this year! Thanks for sharing! Now I know that Portugal is a good place for the horses!